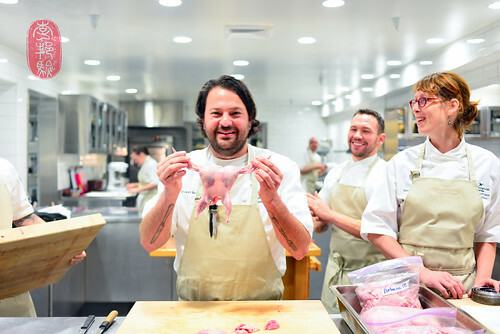 On the fourth of the Twelve Days of Christmas at The Restaurant at Meadowood, Christopher Kostow gave to me Stuart Brioza and Nicole Krasinski of State Bird Provisions in San Francisco, the second husband and wife team to cook at this year’s event. At a question and answer session at the Culinary Institute of America Greystone that chefs Brioza and Krasinski attended couple of days age, Brioza reminded students that we eat with our eyes first. “If you put food in front of people, they’re more inclined to reach for it,” he said. How true that is. When he and his wife first opened State Bird Provisions eleven months ago, they noticed that some dishes on their menu didn’t get as much traction as others. So, Brioza cooked a few extra plates of the unpopular items and had servers walk them around the dining room. All of the servers came back empty-handed, having sold everything the kitchen had given them. Now, State Bird Provisions, which has received an unprecedented amount of press for a new restaurant (it topped many of this year’s best new restaurant lists, including ones issued by Esquire and Bon Appetit magazines), is not only known for the simple, comforting, and tremendously delicious food that the couple cooks, but also for its extremely short menu and a pushcart that is driven up and down the restaurant’s narrow aisles, much like a dim sum cart, stacked with the majority of the day’s offerings. You take what you like, and you’re charged accordingly. Brioza doesn’t have problems selling his food anymore. Last night’s collaboration dinner between Brioza, Krasinski, and hosting chef Kostow (paired with wines from Spotteswoode Estate Vineyard & Winery) presented some of the most fundamentally delicious food I’ve had in the Twelve Days of Christmas dinner series so far. I’ll write briefly about three dishes and the dessert. My favorite dish by Brioza put sweet bay scallops and thin slices of geoduck with a stir-fry of yuba and kimchi. All of it was snowed over with a generous shaving of cured egg yolks (the chicken egg yolks had been cured in a salt and sugar mix for a couple of weeks, then coated with cracked black pepper and air-dried under cheesecloth for another week; the shaved, cured egg yolks added a creaminess to the dish). The acid in the kimchi towed a high, bright line through the otherwise thick flavors. 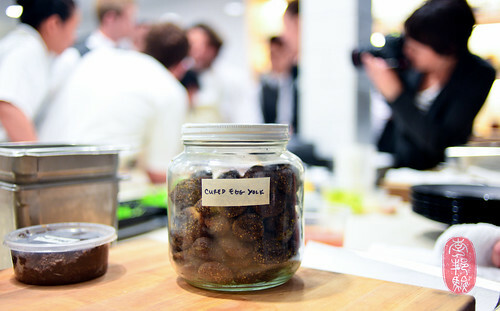 With this dish, he served a warm pork broth infused with Meyer lemon. Fragrant and comforting, it had a little bite from togarashi spice. There’s one dish that never leaves the State Bird Provisions menu. It’s the restaurant’s namesake dish – the state bird of California (quail), breaded, fried, and served with “provisions” (shaved Parmesan and a vinegary gravy). Last night, Brioza served the state bird, but in a different form. He grilled the thigh and served it with baby turnips and a length of juicy blood sausage. In this dish, a drizzle of crème fraîche and some mustard helped to cut the fattiness of the meat, and grains of puffed wheat berries punctuated it all with bits of crunchiness. I especially loved the sourdough “pancakes” served on the side, threaded with sauerkraut and pocketed with creamy ricotta. Those were fantastic. Kostow took us to the Niçoise coast in a velvety mantle of cod tripe meringue, a foamy wonder set by the natural gelatin in the fish’s skin, hovering above warm nuggets of cod garnished with caviar. Served warm, it was like brandade, but better. During the plating of this course, Kostow reminded his cooks, “Don’t skimp on the caviar; ’tis the season after all.” And, indeed, the dish looked like Christmas, a snowy dome dotted with herbs. Krasinski’s dessert was was a crowd-pleaser. Playing on peanut butter and jelly, she layered squares of walnut butter-filled cakes with damson plum jam and topped the tower with olive oil ice cream, candied walnuts, and ribbons of shaved Parmesan. A spoonful of new olive oil was drizzled over each dish as it left the pass. The tug between sweet and salty, creamy and crunchy, was simple and satisfying, yet surprisingly sophisticated in its balance. This was a fantastic dessert. You’ll find the entire menu from last night’s Twelve Days of Christmas dinner with Stuart Brioza and Nicole Krasinski, and a slideshow of the dinner below. carrot purée, and finger lime vinaigrette. and pork broth on the side. Morning glory potato, caviar, dill..
blood sausage, caraway cream, mustard, and baby turnips. Black lime, delicata squash, succulent.. Gin and citrus, tiny licorice. fennel, and new olive oil. ~ by ulterior epicure on December 13, 2012. Might have to try this place next time I’m in the Bay Area!